In the final episode of Quantum Leap, Sam leaps into a bar in Cokeburg, Pennsylvania on the date of his birth at the exact time he was born. He drinks a beer and looks in the mirror. He sees his own reflection. This begins a rollercoaster ride of strange occurences as people from the past appear to him, but with different names. Al the Bartender seems to know everything and may be able to offer some insight to the reason Sam has been leaping in time for the past five years. And back in the future, Al and Gooshie are troubled to discover that there is no one in the Waiting Room. While they feverishly search for a lock on the lost Dr. Beckett, Sam tries to unravel the mysteries of his own life's work, save a pair of miners from a collapsed mine shaft, and finally takes the opportunity to right a major wrong in Al's life. Rate and comment on the final episode! how they were nicknamed the same. This was an excellent episode, except for the finale. It leaves you hanging with a lot of questions. Sam finally get Al and Beth back together. Al's place has been described as the place Sam goes between leaps. It's been said that it may have been a dream or even a scam. It's too bad that this was the final episode, Quantum Leap has so much more potential. But at least you have the virtual seasons, so read those. I really liked the ending as well. It was both tearful and happy to see Al and Beth together, but Sam's "future" seemed alone. A very nostalgic episode that bookended the "Weird Ernie" and "Al the Bartender" and met with many other familiar faces. After watching the 2nd season episode where he leaps into someone playing Don Quixote I finally understood why Sam had that strange look on his face when the bartender said "who knows what don quixote can accomplish"
I'm still a bit unsure of bits in Mirror Image. But it's a good conclusion considering that it was not meant to be THE end. I have a lot of issues with this episode. I do acknowledge that the episode wasn't meant to be the finale, but I really don't like it as an episode, or a finale. Being partial to Al, I thought the writing for him seemed 'off' when he was talking directly to Sam (although I did like his search to find Sam). As horrible as this sounds, I'm not sure I like Sam changing Beth and Al's fate either. I don't know why, I just have a hard time grasping it, I guess. I do agree with saying Sam never returned home, though. I don't think Sam would ever let himself go home, so it is 100% true to character. I love this one it is on my top five list. I think it makes me question things and it did put a few things together while it didn't for other things. My mom and both really like this. I thoroughly enjoyed watching this episode, as it's nothing quite like the other episodes. It was a suprise to see Sam as himself, and it was interesting watching for the references to the earlier episodes and characters. God, I hate this episode. No TV show should ever make me feel this bad. I'm right behind you, Snish. No kidding. This is it - The Finale episode,and the completion of "my mission" - to sit and watch QL from first to last. it took me a few month,but it's happend in the end. What can i say about this episode - Well after today it was finally clear to me,that it wasn't supposed to be the last episode of the series. But if the decesion to shut down the plug on the show were already been determined ...why leave us hanging with "Sam Beckett never returned home"?! As an episode this episode had some very good moments,but it, clearly, wasn't as good as most of DPB episodes ,that, he wrote for the show(Except LHO). To be honest it wasn't one of his best.The main reason is that he didn't really answered none of the question that came up during the 5 seasons of the show. he even raised up more questions after this episode. To be honest this episode were a bit letdown. it,probably,won't get into my top 20 of QL. The kids outside of Al's Bar in the begining of the episodes...weren't they 2 of the Boys from the episode "A tale of two sweaties"?! I don't believe it was actually known when this episode was written and filmed that Quantum Leap was being cancelled. This episode was supposed to be a "cliff hanger" type ending that would lead into a 6th seaon opener and would take us to the future. Since that ended up not being the case, changes had to be made. I believe the cards at the end were put there by NBC and not Bellisario. Last edited by JuliaM; 09-12-2007 at 08:55 AM. I ment to NBC not DBP. I know DPB had no control over it,but i'll always wonder if some other Network could find interest on filming a sixth season. in the past decade i know of at least two shows that were cancelled by the original network ,that air them - DPB's "Jag" that were cancelled by NBC after one season but CBS(if i'm not mistaken) took it and air it for 9 more years,and "Buffy the vampire slayer" that were aired for 5 seasons in the "WB" network and were cancelled,but "PBS"(if i'm not mistaken) took it and they filmed another 2 seasons of theshow. It may sound like a simple answer but NBC basically owned QL at the time and could do what they wanted with it. Whether or not another network decided to obtain the rights to it once NBC cancelled it wasn't NBC's concern or care. Oh and I don't know what network did pick up Buffy once it was initially cancelled but I can assure you, it wasn't PBS. Buffy the Vampire Slayer is so not something that would air on PBS. I believe the network may have been UPN but I really don't know. Oh and I don't know what network did pick up Buffy once it was initially cancelled but I can assure you, it wasn't PBS. Buffy the Vampire Slayer is so not something that would air on PBS. It's pretty funny, but only an American would get the joke. PBS is our educational, cultural, fine arts network. (I love PBS. It's an oasis in the desert.) I think Buffy did go to UPN for its last couple years. But it's really quite rare for a series to be picked up by another network, when you consider how many shows get cancelled every year, and how few turn up again on another network. Thank you. I could not verbalize exactly what it is that PBS generally shows. I guess you could say Buffy showing up on PBS would the equivalent of NASCAR races on the Food Network...it just wouldn't be a good fit at all. My mistake - it was UPN not PBS. 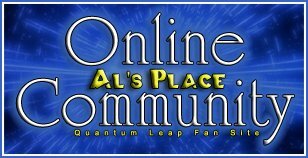 BTW i'm quite sure at the time(1989-1993) - All rights of "Quantum Leap" belonged to "Universal studioes" not NBC. What I think made Mirror Image such a good episode is the fact that it had more questions than answers. It would have been interesting to see what those answers would have been. The show could have gone anywhere. When Sam leaped into the bar, the radio/juke box was playing Accentuate The Positive, a theme song for another excellent TV series in the early 90s called Homefront (1991 - 1993), David Newsom, who played Tom Beckett in QL, is one of the main characters on the show. Why the (assumed) time he was born? Is Sam dead as the Stoppa character was? Maybe a combination of the time and day of Sam's birth, plus the line about dead people returning to help the living is a sort of "Butterfly Effect" (2004 movie with Ashton Kutcher)? (I know QL was first. ) But Al Calavicci finds him with help from Gooshie and Ziggy, so is Sam really dead? Continuing down this path, Angelita from "It's a Wonderful Leap" was a returned dead person helping Sam and the father/son team get the badge for the cab company. Does this represent a parallel for Sam's future? Do Sam and Al ever meet now that Sam changed Al's history? Was Al the Bartender actually God? But you had to feel for Sam because of the look on his face when he said, "I just wanna go home." I thought this episode was heartbreaking and moving. I cried when the screen went black and it said Sam never returned home. It broke my heart. When Al finally found Sam and they talked outside the bar I cried and to see the tears in his eyes both of joy to see his friend and also to wonder if he would ever go home. Maybe this is just me I would of wanted him to at least go home to be with his family or Donna not alone. The time he was born? He (usually) can't leap beyond his lifetime. GFTWS wanted to give Al as much time as possible to find him. Don Bellisario has said that Sam is definitely not dead. It's just a coincidence that he was hired for a job usually taken by dead people. Just a side note, Angelita didn't come to help get the badge, it was so that she could save SAM, because the project made the mistake and he WOULD have ended up dead. We know that Al was supposed to leap to find Sam, so I assume that if he's successful, they'll meet again. Al the bartended said explicitly that he's not God.